Immerse yourself in Wonder Full—an amazing convergence of light, music and sound. Set to a breathtaking orchestral soundtrack, Wonder Full uses light and laser effects to tell the universal tale of the journey of life, so sit back, relax and enjoy. Lose yourself in a stunning showpiece of visual effects of interweaving lasers, searchlights, LEDs, video projectors and giant streaming water screens. For 13 electrifying minutes, Singapore’s city skyline will feel like your own private viewing backdrop. Bring the whole family, and come early to secure your spot. You won’t want to miss out on this exciting, free event which was voted “Best New Tourist Attraction” by ASEAN Tourism Forum. 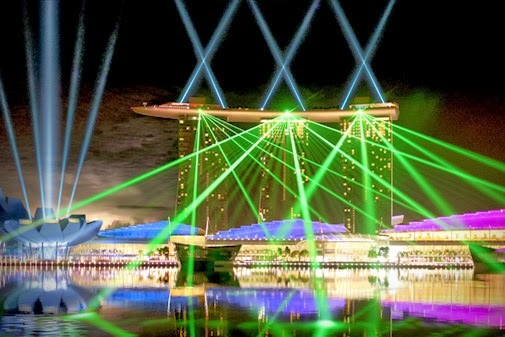 The soundtrack is broadcast live on 103.9FM—the official radio station of Marina Bay Sands. Singaporeans Iskandar Ismail and Daryl Ang arranged and conducted the original score, which was recorded by a 140-piece orchestra. Laservision, the creator of the multidisplay media attraction, controls its technical wizardry down to the millisecond. It took three years and 100 architectural, design, creative, musical, engineering, technical and I.T. specialists to develop the show.